The Swan Songs Serenade provides an opportunity for guests to come together to support the Swan Songs' mission of bringing music to the terminally ill and their family and friends. 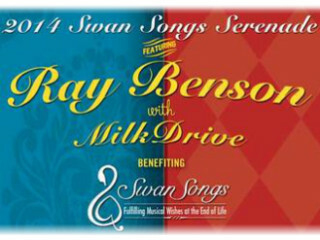 This year's annual fundraising event will feature Ray Benson performing with MilkDrive. Tickets range from $75 (which includes dessert, a live and silent auction as well as the concert) to $150 (which includes a seated dinner, auctions and concert). Proceeds from the event go towards Swan Songs' efforts to fulfill end-of-life musical requests.